A mere 12 years after the first European settlers arrived in the Comox Valley, they got together to put on an agricultural fair. That was back in 1874. It’s incredible that they had time for such a thing, given the ongoing challenges and relentless labor involved in homesteading. Even more incredible is that this event has stood the test of time. It’s seen three different centuries, weathered two world wars, the depression of the 1930s, and the transformation of the Comox Valley from a mainly farming community to a small city with a primarily urban culture and economy. Now in its 139th year, the fair (officially known as CVEX—Comox Valley Exhibition—but colloquially still referred to as ‘the fall fair’) is, of course, redolent with local history. But that’s only half the story. To survive this long—and it’s done much more than survive, it’s grown into a local summer highlight that welcomes close to 20,000 guests each year—this event has needed to change with the times, to reinvent itself over the decades, reflecting the evolution of the Valley, of farming, and of the potential for creating a family-friendly, culturally relevant festival. 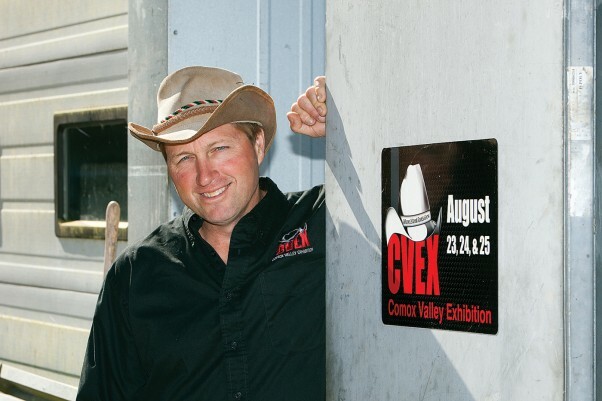 CVEX Board of Directors President Andy Quinn, a Comox Valley dairy and hay farmer, explains that the fair started out as a welcome break from the hard work of farming. “It was a chance for the boys to get together and see who had the nicest sheep, horses, and cattle. It was all in the spirit of a friendly competition,” he says. If some of the fair’s original founders were to magically appear and attend the current fair, they might be overwhelmed—or thrilled—by the crowds, the towering Ferris wheel, fearsome Zipper, and other midway rides, and the sheer diversity and size of the event. They’d probably want to know why so many people attending it aren’t farmers, exactly what chicken poop bingo is, and just how it is people find time for dachshund racing and face-painting. They might get completely distracted by the magic show, and they’d need to a bit of help to understand just what “The A-MOO-zing Race” might be. But they’d also find plenty to make them feel at home—there are competitions for the best pigs, goats, sheep, chickens and cows, the largest sunflower head and tallest corn stalk; there are exhibits of heritage farming machinery; there are lumberjacks showing off their sawing techniques; there’s cattle sorting, sheepdog trials, and barrel racing; there are contests for the most beautiful quilts and the tastiest home-baked pies. In its contemporary incarnation, the fair still offers farmers that chance to get together, compete, and feel proud, but it also reaches out to the general public. The idea is to bring these two worlds together—something that is urgently needed these days. “Today, the fair is a rural-urban interface,” says Quinn. Therese Schwab, the fair’s Executive Director, follows up: “This is a celebration of agriculture, but we aren’t preaching to the converted. We are bringing together rural and urban. We are showing people that the food they buy and eat all starts on the farm. We’re inviting urban families to appreciate farming, encouraging people to buy local, encouraging them to grow a garden, encouraging them to grow their own cucumbers and dill and then make pickles. Some kids, even city kids, are already on that journey, and for them the fair offers validation and a chance to have fun. These are the members of the 4H Club, an organization for youth aged eight to 21. 4H members learn agricultural skills, as well as public speaking, leadership and self-development. The name comes from the 4H pledge that offers Head, Hands, Heart and Health to the club, community and country. At the Comox Valley fair, there’s a huge range of 4H contests. Participants can enter animals they own or lease in a wide range of different classes of competition. Just the goat category alone has 15 sub-categories, ranging from “Doeling under one year” to “Doe with kid at foot” to “Dairy Goat herd (member to manage at least four milking does with kids, keeping detailed records)” and including a costume class. There are also 4H competitions in crafts, sewing, quilting, foods, small engines and photography. 2013 marks the 100th anniversary of 4H, which is one reason the CVEX organizers chose “Where Island Roots Grow,” with its nod to history, as the theme for this year. Local 4H Calf Club member Tyra Schaad, a 13-year-old who lives near Courtenay on her family’s beef farm, will be showing her heifer Kate at the fair this year. She joined 4H about two years ago, mostly because it looked like “a lot of fun,” she says. “My dad and my mom both had a lot of stories about being in 4H when they were kids,” she says. “I like all the activities. We were just out planting flowers for the town, and sometimes we have barbecues as fundraisers. Mainly, I really like learning about farming and showing at the fairs. “I like that we learn about the animals and how to judge them, so I can know what a good animal looks like and what a bad animal looks like,” she adds. “For instance, you want your cow to have good straight legs, and then also there is something called depth, which means a good wide ribcage. And for my heifer they’ll be looking at her hip bones. They should be wide apart so that in the future her calves can come out easier. “This way, if I ever have my own farm, I’ll know what animals to get,” says Schaad. In an age when it seems children and youth are less and less connected to nature, 4H members like Schaad seem to be bucking the trend. Schaad says she doesn’t own a gaming console or any gadgets other than a somewhat neglected iPod, and she spends most of her free time outside with her horses, chickens and cows. “If I talk about this stuff with my [non-4H] friends, they don’t know much about it. But they seem pretty interested,” says Schaad. But most kids, and their parents, come to the fair simply to have fun, says Quinn. And he wouldn’t have it any other way. Schwab, whose job it is to translate the Board of Directors’ vision into reality, says their programming goal is to have something for everyone. “So for some people, a big part of it is the live music. We have two stages with lots of different entertainment. For some, this is their second MusicFest,” says Schwab. Comox Valley favorite Helen Austin presides this year as master of ceremonies and star performer, and there is a full program of entertainment including Luke Guthrie, Sue Pyper, kids’ performer Captain Thunderpants, and a variety of dance, including the K’umugwe dancers, bellydance and square dancing. “And we’re making sure we engage all ages,” adds Schwab. “Younger kids can find their way through the corn maze, watch a clown, build with Lego, jump on the inflatable bouncer, and more at the kids’ zone. For pet lovers, there are dog agility events, dachshund races and adoptable kittens from Kitty Kat Pals. For horse fans, there’s a group synchronized dressage performance, barrel racing, cattle sorting and a Western Games horse show. For thrill lovers, there’s the midway. And for everyone, there’s the food. After all, there’s a not-so-old saying that eating is an agricultural activity. The fair features pancake breakfasts Saturday and Sunday mornings, food booths of all kinds, and cooking demonstrations from local food producers. Surprisingly often, some of the fair’s greatest moments are unplanned, says Quinn. “I remember one year, I was helping the antique tractor guys bale straw they’d cut with an ancient thresher. When I was done, I parked the tractor behind the kid zone. Well, I didn’t predict it, but that tractor became the biggest attraction for those kids; they were climbing all over it, pretending to drive it, having a great time. Those early Comox Valley settlers might not have expected that their friendly get-together would still be going strong in the 21st century, as a professionally-run, major event that depends on the support of hundreds of volunteers and dozens of generous sponsors. But it’s a pretty safe bet that if they could pop back from the afterlife to attend the fair, they’d have a great time, and would feel proud to see that the event they founded has, while evolving with the times, managed to stay true to its roots. The Comox Valley Exhibition runs August 23, 24 and 25, 2013 at the Comox Valley Fairgrounds, Headquarters Road in Courtenay.